The much-anticipated Essentials of WJ IV Cognitive Abilities Assessment is scheduled for publication in March, 2016. The lead authors are Fred Schrank, Scott Decker, and John Garruto. This authoritative resource for use and interpretation of the WJ IV COG begins with a discussion of the evolution of the Woodcock-Johnson cognitive battery from 1977, progresses to the interpretive plan of the current edition, and provides a concise perspective on the evolution of contemporary CHC theory that is so closely associated with the WJ IV COG. Expanded guidance on administration and scoring is provided by Melanie Bartels Graw, whose contributions reflect more than 25 years of experience in development and publication of the Woodcock-Johnson tests. An extensive interpretive chapter by WJ IV author Fredrick Schrank weaves contemporary neuro-cognitive research with CHC theory to effect an understanding of what each test and cluster measures and how limitations measured in specific tests can be addressed with targeted interventions or accommodations. Robert Walrath, John Willis, and Ron Dumont give a balanced critique of the WJ IV COG’s strengths and weaknesses and whole-heartedly endorse the battery for use in a wide variety of clinical and educational settings. Scott Decker applies his expertise in neuropsychological assessment to several case studies that demonstrate the different levels of WJ IV COG interpretation. John Garruto’s case studies contribute the perspective of a practicing school psychologist in use and interpretation of the WJ IV COG. A special appendix by the WJ IV authors (Schrank, McGrew, & Mather) helps clarify the purposes and usefulness of the Gf-Gc Composite for evaluation of specific learning disabilities. 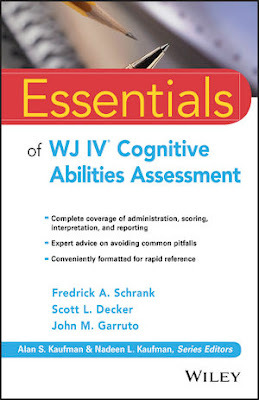 In summary, the Essentials of WJ IV Cognitive Abilities Assessment goes beyond the information provided in the WJ IV manuals and bulletins to provide a single, easy-to-understand resource for using the WJ IV COG in contemporary assessment practice.